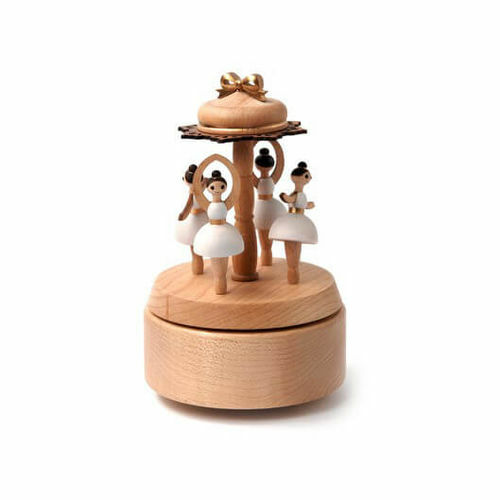 Ballerina Wooden Musical Box | A gift to inspire the young ballerina! A gift to inspire the young ballerina! A one touch start and stop design. This Ballerina Music Box is a must have gift for any little dancer. The ballerinas twirl around gracefully to the classic tune of Tchaikovsky's Waltz of the Flowers! With an old-fashioned clockwork mechanism, simply wind the top of your music box and use the on/off switch on the side to start and stop the music. Crafted neatly from real wood with a satin gloss finish, it's the perfect size for your night stand, or as a decorative mantelpiece ornament. Dimensions: 14cm x 10cm x 10cm. Recommended for children ages 3 and up due to small parts.